It’s hard to pick a favorite Springsteen tour, but I’d vote for The River Tour of 1980-81. Springsteen had just released his first double album, The River, filled with a joy that had been lacking on his previous two albums, 1975’s Born to Run and 1978’s Darkness on the Edge of Town. It was chock-full of rockers that captured the energy of Springsteen’s live performances (“You Can Look (But You Better Not Touch),” “Sherry Darling,” “Crush On You,” “Ramrod”). Even the poignant tale in “Hungry Heart,” the story of a man who abandons his family, was done up with a Wall of Sound and a perfect singalong chorus. On The River, Springsteen contemplated marriage, death, and relationships on slower ballads, such as “Independence Day,” “Point Blank,” and the album’s centerpiece, “The River.” The River became another Springsteen classic, and it continued his dramatic rise from New Jersey guitarist to worldwide superstar. The concerts on The River Tour included most of the songs from The River, plus scores of tunes from Springsteen’s other albums, songs Springsteen gave away to other artists, and classic rock covers. The band would take the stage wearing jackets and ties as if dressed for a dinner party. 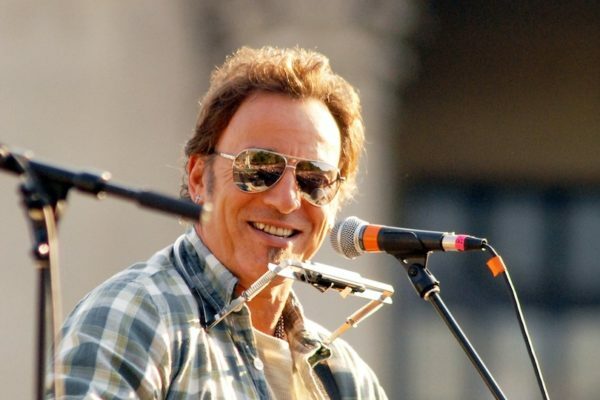 With a musical explosion, the band would launch into their driving opener, usually “Born to Run” or “Prove It All Night.” For the next three hours plus, audiences would watch as Springsteen would sing and shout, fling his guitar around his body, jump up on speakers and a piano, body surf the crowd, and dance around the stage. Every member of the band responded to Springsteen’s changes like a well-tuned machine but with the illusion of spontaneity. Each song was performed as if it were the last song the band would ever play — from the opening notes of “Thunder Road” to the epics “Rosalita” and “Jungleland” — and Springsteen wore a constant Cheshire grin even when he was at the point of exhaustion in his third encore. You can get an excellent taste of The River Tour with the recently released film of a 1980 Tempe, Arizona Springsteen concert. It comes as part of the The Ties That Bind: The River Collection, a new box set that provides a comprehensive look at the creation of this #1 album. In addition to a newly remastered version of the The River, the set contains a wealth of unreleased material, including an early, single disc version of the album that was submitted to the record company and then withdrawn by Springsteen. There’s a brand new, one hour documentary on the making of The River, featuring an intimate interview with Springsteen himself. The lavish set also contains two books with photographs, handwritten song lyrics, and commentary from Springsteen. Yet, it’s the Tempe concert that is truly the highlight of this excellent box set. The professionally shot film has remained in the vaults until now, and it’s been released with remastered audio from two of the industry’s greatest audio engineers, Bob Clearmountain and Bob Ludwig. Like the live footage in the Born To Run and Darkness On The Edge Of Town box sets, it shows why Springsteen’s concerts were always among the greatest live shows. By the way, The River Tour has been resurrected to mark the release of this special set, with Bruce Springsteen and the E Street Band giving an in-sequence performance of the 20 songs from the 1980 album at each North American stop. The 2016 incarnation started last month in Pittsburgh and new dates have now been added through April. Even today, there are few experiences that can match the excitement of a Springsteen concert. PS. Springsteen isn’t the only legendary artist heading out on tour. The godfather of punk is next, thanks to a new album that we preview in Iggy Pop: A Real Wild Child Returns. And for other great music documentaries, check out That’s My Jam! and These Guys Were REALLY Behind the Music.